While I wallow in a compliment from one of my neighbour’s rather adorable 12 year old son when I asked him why he preferred my short hair (“It looks more sophisticated”) (we’ve marked him down as a future charmer ;-)) I would like to take you back to the first blog post in my kefir series, that kicked off all the way back to last October. I know. Ain’t that time been swallowed up by an uber hungry Time Eating Machine?! It’s such a simple and yet such a positive change to your daily diet to add some kefir into the mix. The more I read magazines, online articles and newspapers, the more the news is reporting the benefits of fermented food and drink and kefir is such a wonderfully healthful drink and one of the easiest fermented recipes to make. Join me on the fermented adventure, with a cheeky little taste of kefir! Follow the series day by day and you will learn why it’s great, how to choose grains or powders, how to make it, how to second ferment, make kefir cream cheese (all super easy!) how to trouble shoot and … how to enjoy drinking and eating it! And this is where the series ends (and YOUR adventure begins!) …. Don’t want to drink the kefir? 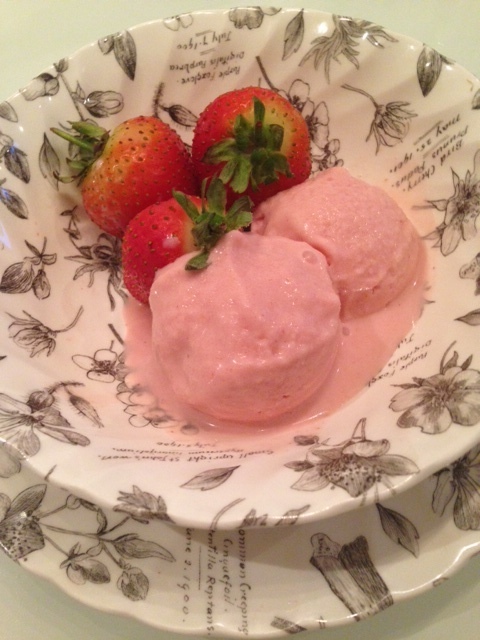 Here’s the easiest strawberry ice cream (or sorbet/yoghurt ice – whatever you prefer to call it!) to make with your kefir! Just post them here and I’ll be MORE than happy to help! Milk Kefir – What’s Stopping You From Making It? Milk Kefir – Let’s do flavours! !